You know how you add stuff to your to-do list twice as fast as you check things off of it? This is especially true of people learning to code. There are more learning resources online than you could work through in a lifetime. Collecting things to do is just so fun! New things! To do! This is the problem we wanted to help solve. 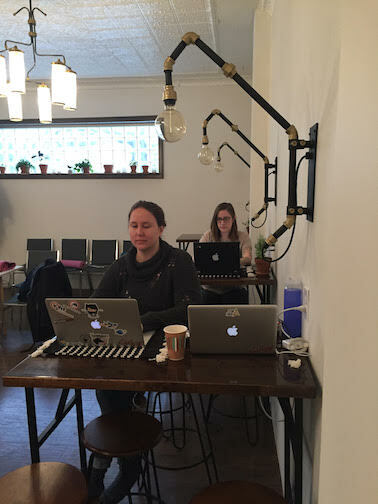 We at AkronWiT decided to host a one-day Coding Retreat here in Akron. Our goal was to give women in tech the opportunity to leave their daily distractions behind and work on their programming goals in a supportive environment. We rented out The Grand Exchange, bought way too much food from Aldi, and showed up on April Fools’ Day to knock some of those project ideas off of our coding to-do lists. 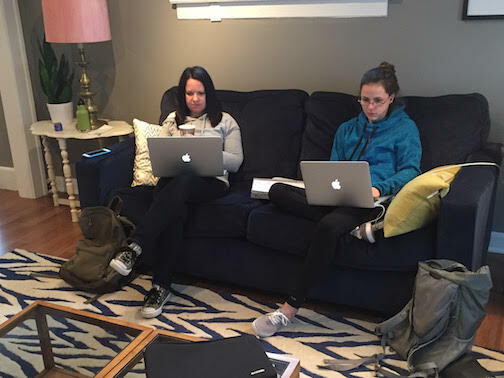 Attendee and co-organizer Heather Fenton said, “The Coding Retreat provided the perfect environment to get things done. Great space, great support, great food and yoga! I am really excited for the next one!” The yoga she mentioned was an 11am yoga break, led by certified yoga instructor Kristie Leahy, which helped keep the creative juices flowing and got everyone ready for lunch. Everyone in attendance agreed we should host more Coding Retreats. Who wouldn’t love a day to accomplish goals, eat food, and do yoga, all while hanging out with other equally motivated and driven women? If you’re a woman working or interested in the tech industry, and a Coding Retreat sounds awesome to you, keep an eye out for the next one by signing up for our newsletter.